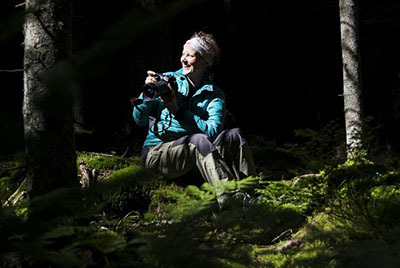 —— NOW it is finally done – the book of the national parks of Finland – a book in Finnish language and another book in English language. Over 720 days (and/or nights) spent in Finnish national parks since 2010. Over 140 000 kilometers on the road and over 200 travel days each year since 2010. Here is the front & back cover + some randomly chosen pages of the book. The name of the Finnish book is: Kansallispuistot – maamme luonnon helmet & the name of the English book is: The national parks of Finland. 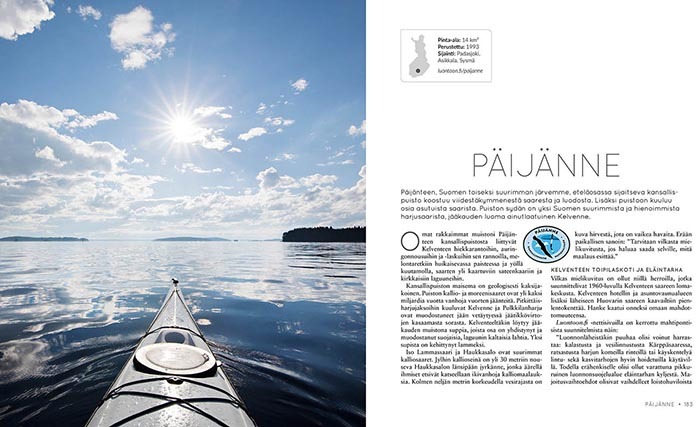 My 7-year project is done: the book of Finnish national parks went to printing on Monday (July 3). It will be published in Finnish and English languages (different books) end of Aug. 2017. Now starts a new life without any hurry. HUH. This word expresses my feelings now. There has been more than enough passion for making this book & touring the 40 national parks during total of over 700 days (since 2010). Therefore I am physically extremely tired right now. While at home, I have been sitting next to my computer from the morning until evening. This past winter and spring I spent writing and making photos from the morning until bedtime without having even a half a day of for 7 months (no X-mas, Easter, etc. for me). Everyday I had a short exercise moment to clear my head and to get fresh air. I mostly ate my food next to the computer. But this was my choice. Finland is celebrating its 100 years of independence this year (Dec. 6th) and I wanted to make the book ready now. If you are interested in, you can order the book from me by e-mailing (teakarvinen at gmail.com) or filling out this form. 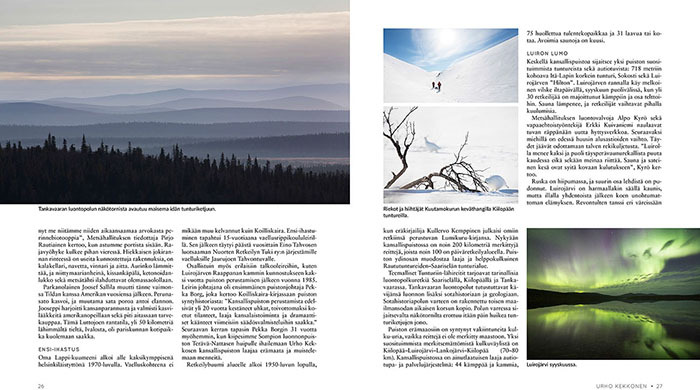 Three example pages of the book above: Riisitunturi np (near Kuusamo), Päijänne np (in the South) and Urho Kekkonen np (in Lapland).